Happy Fourth of July to all the Americans out there! By the time you are reading this I should have hopefully finished a 5K race that I decided to run at the last minute. Why not preemptively burn off those hot dog calories? 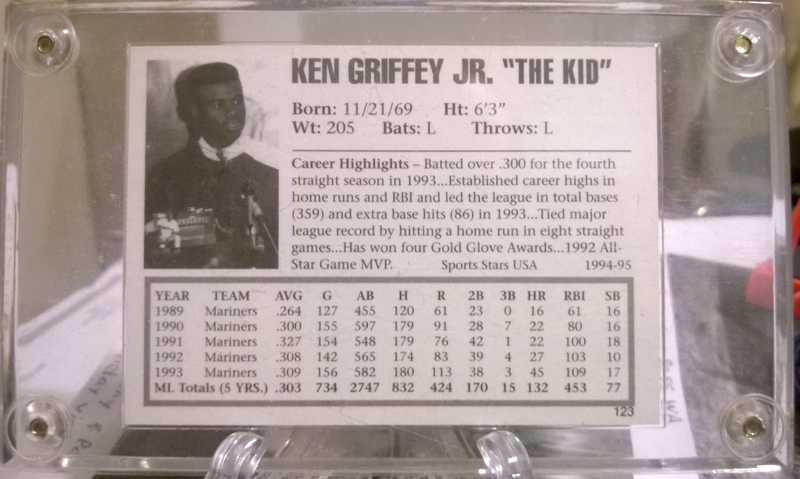 1994-95 Sports Stars USA - #123 Ken Griffey Jr. There is no particular story behind this card. My parents took me to the card shop to buy probably some Magic cards and I spotted this card behind the display case. The big price tag (for a kid), the shiny lettering, and the fact that it was in a special case were all highly influential in my decision to buy this card. Unless I am mistaken, this card is unauthorized. I had no idea back then though. All I knew was that it looked cool. It is well made and I don't think I will break it out of its case any time soon. 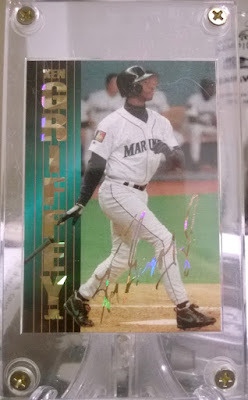 Griffey ruled the 90s. There is no doubt given his influence on a little kid that couldn't even stay up to watch his games on the West Coast. The Simpsons have been deeply ingrained in the cultural fabric of America ever since the show took off in the 90s. Don't let anyone tell you otherwise that the 90s was the best and only good decade for the show. A while back I stumbled upon the musical genre of ＳＩＭＰＳＯＮＷＡＶＥ (the stylizing is intentional). What the Hell Is Simpsonwave, you ask? Simpsonwave is a genre of Youtube music videos consistent of classic Simpsons footage overlayed with a VHS quality filter and washed out colors. The soundtrack to the videos is exclusively vaporwave, which is a type of electronic music that has many other influences I don't know even bother to know outside of looking it up on Wikipedia. The genre is perfectly encapsulated in the above video. The Vine clip is what I'm really into most about this song. During the course of drafting this post I listened to the above video twice. That's a six second clip, looped for 10 minutes, twice. I can picture it now: open road; windows down; summer weather; no destination. I can drive to this song.